Did you always intend to raise money for the film via crowdfunding? Getting your first feature financed is really tough. You are asking for money and people are looking for reasons to give you the money. Even with a great script, people are trying to reduce their risk, genre, talent, pre-sales, incentives, etc. It’s funny because we had much more “commercially viable” projects we were developing, but you’re still asking people to give you money and the fact that you haven’t made a feature before is the biggest roadblock. So we decided to go out and make a film; to make something with what we had and not have to rely on others to make a film. We didn’t want to wait. We wanted full control, to use the resources we already had; use stuff within reach – we knew the locations, we knew all the actors, we had the T-bird, and the car. And crowdfunding is part of that. It’s a platform to get the people who believe in you to come together and support your project, and your dreams. No matter how big or small – sure, fame and branding can help reach masses, but we didn’t think of it that way, we didn’t have a gadget or a pre-existing fan base to bank on. We wanted to tell the people who we knew what we were doing and how they could support us. That’s how we used crowdfunding. Everything else was gravy. What made you select Indiegogo? The fact that there is the option to take what you raise and it isn’t “all or nothing” was the main reason we chose Indiegogo. We didn’t know how much money we could raise. It’s an Iranian Vampire Western, in black and white and Farsi. No big names, or existing brands, or product to pre-sell, just a really cool unique film that we wanted to make. We didn’t want to aim to low, but we also didn’t want to leave any money on the table, so we chose Indiegogo. How far in advance did you plan the campaign? All successful campaigns look sleek. And nothing will make people click away from your campaign than a page that looks sloppy. Ana Lily is an artist and places tremendous attention in every detail of anything she does, and our campaign page was a well-planned and organized extension of her artistic creativity. Careful planning is necessary, but it’s not a “build it and they will come” situation. A good campaign needs constant energy being pumped into it. Lily was constantly adding videos and making updates during the campaign. We probably planned the campaign for a month or so, putting the pitch video together, and organizing the elements, the cast, the characters, the synopsis, the locations, etc. The campaign was the first place we really presented the elements in the script together, the characters, the locations, the T-bird, the cat, and in doing so, Ana Lily created the mythology of Bad City. What was the most surprising aspect of the campaign? Was there any element of it that you hadn’t expected? People really latched onto it. It took on a life of its own. One of our perks was to name a street in Bad City in return for a donation. We had a fictional map with unnamed streets and people gave us donations and chose a street and named it whatever they wanted. It was pure genius, it was instant gratification for the “citizens” of Bad City, and it cost us nothing. Initially, I was really surprised at how much people liked this perk, but it made sense because you were giving people a chance to become part of the story, even if this map didn’t have any life outside of the campaign. About two-thirds of the way through our campaign we threw a fundraiser. We thought, “what do the people on we are targeting like to do?” They like to party. 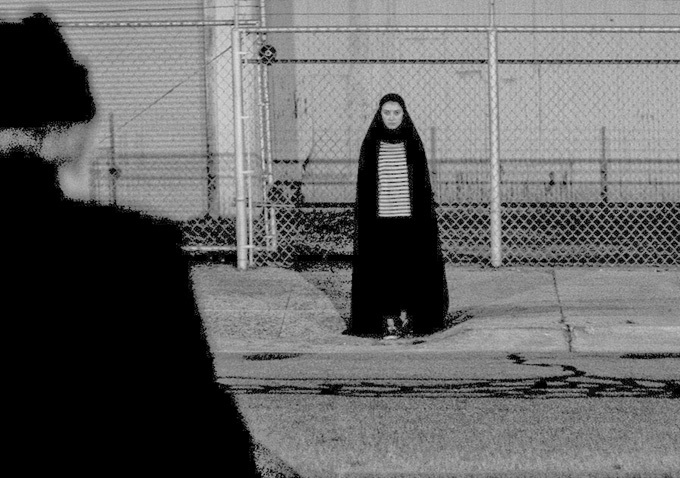 So we decided to throw a “Girl Walks Home Alone at Night” fundraiser. We rented a gallery, had a DJ, had Iranian Vampire themed hors d’oeuvres, and Hobo wine, and we invited our friends and family, many of whom drove down from Bakersfield. We even had a huge map of Bad City, with the names of the streets that people had bought until then. Even though this was a live event and we could have just taken checks, we had iPads and we asked everyone to donate through Indiegogo. This goes back to the importance of having a successful campaign, we wanted our donations to show on the campaign page, to build even more momentum, even if it meant paying some of the money to the platform. Indiegogo was great to us. We went to an Indiegogo panel when we were at ComicCon 2012 to promote the film. We were already one week into Indiegogo campaign. After talking to them, they advised us to lower our goal as well as extend our campaign, both are factors which contributed to our success. At that panel, we also met Margaret Atwood, who loved the project and tweeted about it to hundreds of thousands of followers we probably wouldn’t have otherwise reached. One thing led to another, we were Project of the Day and on the front page of Indiegogo, we got mentioned on Wired.com, and it led to us attracting additional investors and bringing Elijah Wood on board. It was an integral part of our overall financing strategy. But this stuff happens organically, and there’s no formula. One thing that happened was it gave me the confidence to take out a hefty loan in my own name, a big risk that most people would caution against, but hey, it was time to take a chance and I really believed in this project – and the success of our crowdfund only bolstered that belief. I also learned crowdfunding can be fun, lots of fun. Having people support your film at such an early stage is exciting, and you can reach thousands of people or more. It is free marketing. With independent film financing, you often find yourself asking one investor for a lot of money for an execution dependent project, and you often hear “no.” With crowdfunding you are asking a bunch of people for a small amount of money for a project that is continually gaining support. Successful crowdfunding created a built in fan base for the film. That fan base made our investors more likely to say “yes” to giving us larger chunks of money. And that fan base also created a momentum that carried us through production and beyond. Just yesterday someone posted a picture of us at the Indiegogo panel at comicon on Instagram in support of the film’s current theatrical release. What tips do you have for other filmmakers looking to crowdfund? Do it, the power is in your hands. But be realistic – because success is key, even for if you opt for the “take what you make” option. I would rather raise $50,000 and meet our goal, than $60,000 and undershoot a $90,000 goal. There is intrinsic value to reaching your goal. It creates excitement and people look forward to what’s coming. We didn’t raise anywhere close to our shooting budget, and we really didn’t know where we would come up with the rest of our budget when we started our campaign, but we knew we would make the film, one way or another. Our plan was just to hold the money until we got the rest. Also, do it, but do it ONCE. No matter how energetic and exciting your campaign is, you are still asking (pressuring) your friends and family into giving you money, and that can get annoying. So I would advise people that are crowdfunding for artistic projects to really take your best shot, because you’re not gonna get the same type of love the second time around. And be creative, there is no recipe for crowdfunding, sure there are certain “musts” – but you really need to tailor your campaign and your perks to the people you are trying to reach. We had a bunch of different types of perks, from custom “Bad City” diamond dog tags, to the more traditional merch like posters and hats to creative perks such as catered dinners, credits, and even naming streets in the fictional town of Bad City. We made fun videos lip-syncing or spoofing popular songs such as “We built Bad City,” “Eye of the Tiger” and “Final Countdown.” Although the money that is raised through donations, it is not free, it takes a lot of hard work to execute a successful campaign, and what you get out of it is directly proportional to the time and energy you put into it. Editor’s Note: The “How They Funded It” series is presented by Indiegogo. Indiegogo has the largest, independent film fan base in the industry, all eager to discover new movies, new genres and new film projects. To learn more visit www.indiegogo.com.